After a gorgeous week weather-wise, we awoke to rain on Saturday morning. But, thankfully, by the time I arrived in London, it had cleared up so I walked along the Thames from Waterloo to London Bridge. There I met family and friends for lunch at a lovely pub before making the short trip to South Bermondsey. The train was packed with Watford fans making a lot of noise. 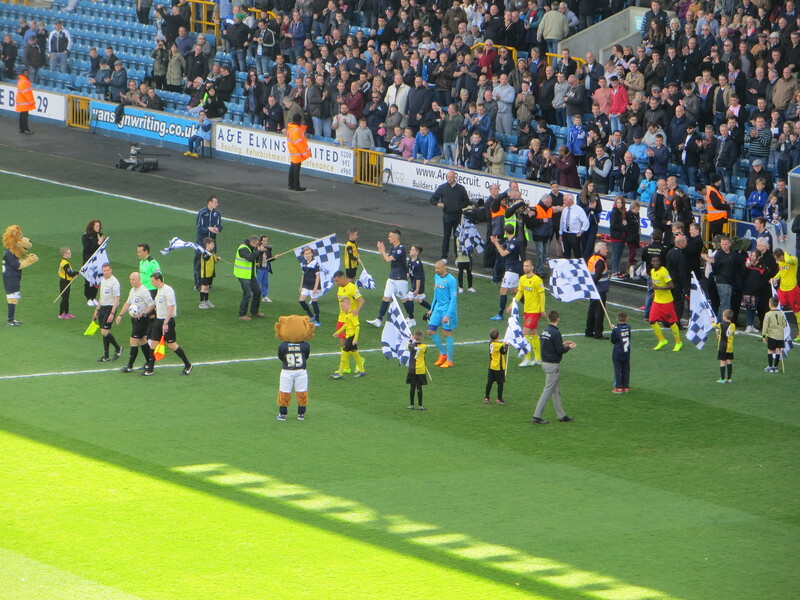 The travelling faithful were full of confidence but, while Millwall were unlikely to provide the sort of challenge that Derby and Middlesbrough did, they were fighting relegation so this was not going to be an easy game. Jokanovic had made two changes from the Middlesbrough match. Connolly came in for the injured Cathcart and Vydra was preferred to Ighalo. So the starting line-up was Gomes, Hoban, Angella, Connolly, Anya, Guedioura, Tözsér, Watson, Paredes, Vydra and Deeney. As they took the field, the Watford players were greeted with ticker tape, streamers and yellow balloons from the travelling Hornets. Watford almost made the perfect start as Tözsér played a ball over to Deeney but Forde was quickly out of his goal to block the shot. Millwall threatened as Gregory broke forward and appeared to be held back by Hoban which gave Gomes time to gather the ball at his feet. Gregory had another chance when the ball dropped to him in the box, but his shot was poor and flew well wide. 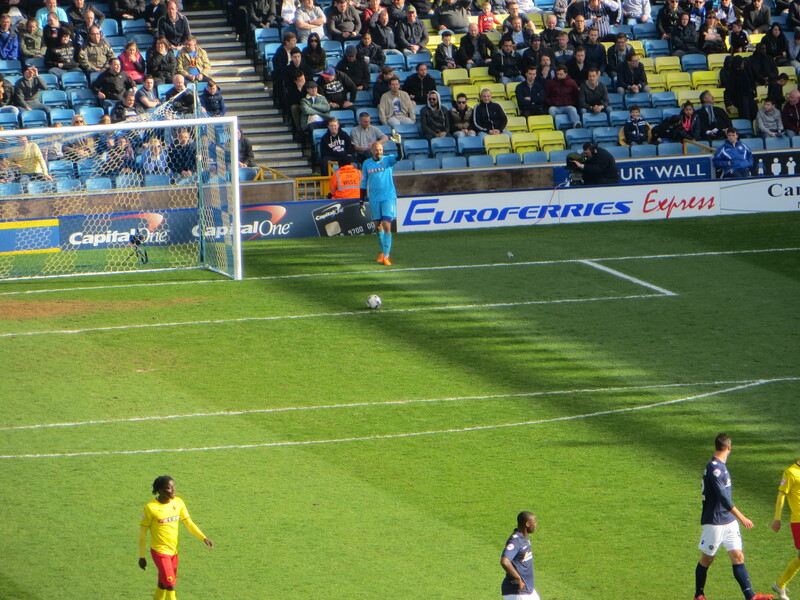 At the other end, Deeney got on the end of a Guedioura cross but he headed over the bar. At this point the chanting in the away end turned to the subject of the bizarre pigeon that was suspended from the roof in front of us. There were loud appeals for a Millwall penalty as Upson went down in the box. It didn’t look like a penalty from our vantage point, although I would say that. Thankfully the referee agreed and waved play on. The visitors had a good chance on the counter attack as Tözsér released Vydra who found Anya on the overlap but the Scot’s cross was disappointingly straight at Forde. Watford took the lead on 25 minutes as a lovely long pass from Tözsér found Anya on the left, he cut it back to Vydra who hit a clever volley into the corner. It was a gorgeous goal well worthy of a manic celebration. We could have been two up soon afterwards as Paredes found Vydra who couldn’t get a shot in so moved the ball on to Watson whose shot was well wide of the target. Another Watford chance went begging as Deeney found Anya on the left but his low cross was just too far in front of Vydra. 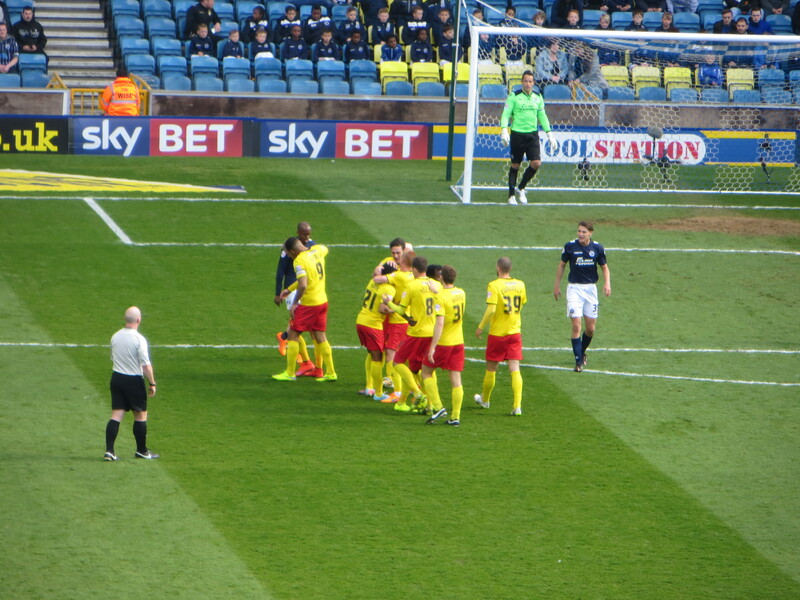 Millwall had a chance to hit back with a free kick in a dangerous area, but Upson directed the ball well over the bar. Watford almost pushed the self-destruct button as Angella failed to shepherd the ball out, thankfully it was eventually cleared. In the next move, the ball reached Woolford in the box but Gomes dropped to save his shot. Needless to say, the 44th minute was greeted with applause and chants of “One of our own” for Nic Cruwys, about whom it was good to hear some positive news this week. Millwall had a great chance of an equalizer just before half time as a shot from Abdou came through a crowd of players and Gomes seemed to see it late, but managed the save. So we reached half-time a goal to the good. 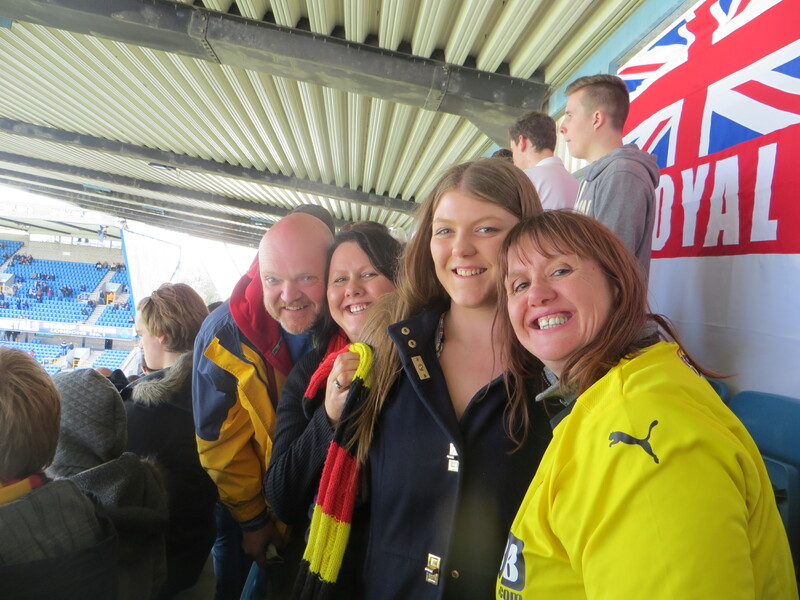 It hadn’t been a classic performance from Watford, but Vydra had scored with a lovely strike and Millwall, despite having a lot of possession, had not really threatened the Watford goal. There was encouraging news from the other grounds as the half-time scores meant that we would overtake Norwich to take second place in the table. But there was much more important stuff going on at half-time as the tannoy announcer congratulated Gladys Protheroe on the occasion of her 75th birthday. Millwall threatened in the first minute of the second half as a header from O’Brien appeared to be blocked on the line. Deeney then had a chance to increase the lead as the ball rebounded to him in the box, but Forde was out to save at his feet. At this point the Watford crowd started a chant for our head coach to the tune of Amarillo, which seemed most incongruous. On 50 minutes Millwall’s Williams hit a free kick just wide of the target. Watford nerves were settled just before the hour mark as Vydra played the ball to Deeney who advanced before passing to Anya who cut the ball back to Guedioura who fired past Forde in front of the travelling fans who erupted for yet another mental celebration. 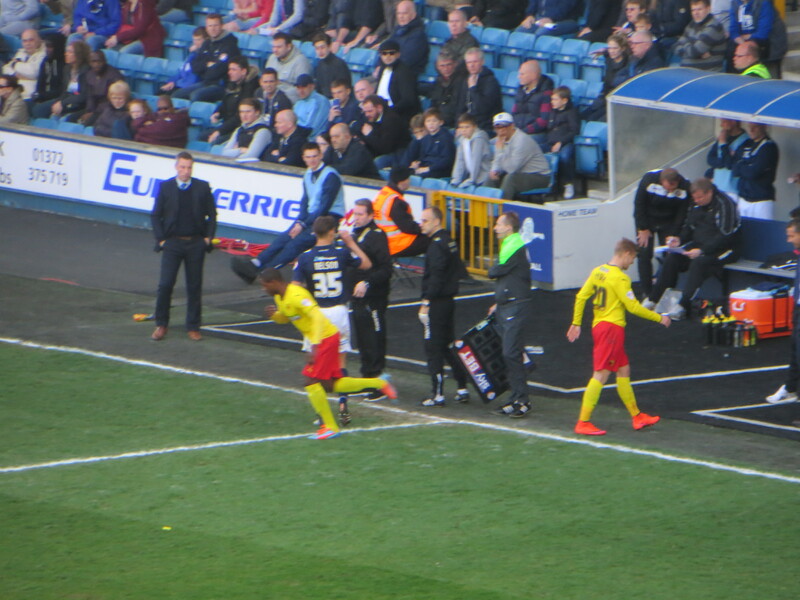 The first Watford substitution saw Anya make way for Abdi. Millwall looked sure to pull a goal back as O’Brien powered into the box, but Gomes made himself huge and blocked the shot. Watford had a good chance of a third goal as Vydra was one-on-one with Forde but the keeper managed to gather the ball. Gomes did brilliantly to keep his clean sheet as he punched a header clear with Maierhofer closing in. Both players ended up on the turf, but there was no harm done. A run down the wing by Abdi was stopped by a hack from Nelson. The Millwall man received a yellow card for the foul and, thankfully, Almen was fit to continue after treatment. The home side wasted another chance as Gueye met a cross from Martin with a poor volley that cleared the target. The home fans appealed in vain for another penalty as a shot was blocked by the chest (arm?) of Angella. Into the final 10 minutes there was another shot from Gueye which was easily gathered by Gomes. Jokanovic made his second substitution replacing Vydra, who was given an ovation from the Watford fans, with Ighalo, who was greeted in a similar manner. The Nigerian almost made an immediate impact as Guedioura found him in the box but Forde was there to block his shot and then reached up to push the rebound away from the head of Abdi. A quite brilliant double stop from the Galwegian. Deeney had a great chance to increase the lead with a powerful shot from an Abdi cross, but Forde pulled off another fantastic save to deny him. When Guedioura found Abdi in space, you would have put your house on Almen scoring from that position, but he hit it well wide, much to the bemusement of the travelling Hornets. Watford made a final substitution in time added on as Motta replaced Paredes, who left the field with the jeers of the home fans ringing in his ears as he had just fallen rather theatrically under a challenge. The final whistle went on a convincing win by the Hornets which was slightly marred as news of Norwich’s injury time winner filtered through. Abdi’s miss and Forde’s brilliant saves suddenly took on a greater significance. But it was job done for the Hornets who remain third in the table and have cut the gap in goal difference to a single goal. So, we have four games remaining, which will all feel like cup finals. Both players and fans have to approach them with the belief that we can win every game and score enough goals to gain automatic promotion. See you all at the City Ground on Wednesday. This entry was posted in Watford FC and tagged Adlene Guedioura, Aiden O'Brien, Almen Abdi, Ben Watson, Dan Harding, Daniel Tozser, David Forde, Ed Upson, Gabriele Angella, Heurelho Gomes, Ikechi Anya, Juan Carlos Paredes, Lee Gregory, Lee Martin, Magaye Gueye, Marco Motta, Mark Beevers, Martyn Woolford, Matej Vydra, Matthew Connolly, Millwall FC, Nadjim Abdou, Neil Harris, Odion Ighalo, Shaun Cummings, Shaun Williams, Sid Nelson, Slavisa Jokanovic, Stefan Maierhofer, Tommie Hoban, Troy Deeney, Watford FC on April 12, 2015 by franelynn.